One of the big benefits that always-online games has is that they can be topical and right now the only topic bigger than Fortnite is the World Cup so it’s not especially surprising that Epic Games has decided to bring the two together. To celebrate the beautiful game, Epic has added a range of new items to the game. When you glide into a Fortnite match now you’ll find a brand new stadium and you can compete in challenges to score goals on some of the football fields that have popped up everywhere. Naturally, there are also some neat cosmetic items you can buy. Not satisfied with wearing you team’s colors in real-life? You can represent them in Fortnite too with six new male and female kits at 1200 V-bucks apiece. The kits come in a range of patterns and you can choose the color combinations yourself as well as the number on the back. Outside of outfits, there’s also a football themed glider and new Emotes like red card and kick ups. Of course, outside of the official World Cup, Epic Games is also starting up the official Fortnite World Cup. 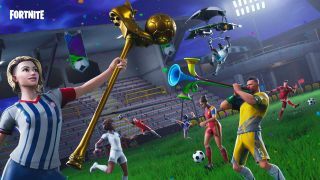 Announced during E3, Epic will begin its World Cup qualifiers later in 2018 before finishing things off with the very first Fortnite World Cup in 2019. Epic is giving everyone a chance to compete in its competition for their chance at a cut of the $100,000,000 prize pool, with Epic stating that qualifications will be “based on merit".